I’m here. Cross my heart, I’m still here, posting ever-so-infrequently on facebook and instagram and soaking up the last of our summer in a non-cyber way. Now that we’re getting back to the grind (and it appears that many of you are as well, as I’m seeing the darling first-day-of-school pictures in my newsfeed), I’m getting back to blog business and I’m SO excited to share my newest printables! As we prepared for our sixth year in homeschooling (I feel gray hair coming on just typing that out…), I set about trying to find the most amazing and perfect homeschool planner. There will be more on that – because truthfully, there are some great ones out there and I have no problem pointing you in their direction. However, as much as I love planners (and I have a small ADD-induced collection of pretty fonted planners on my bookshelf and desk), it was taking me for.ev.er. to find a homeschooling planner that was what I wanted and needed. Many of them were too bulky, with more pages than I needed, and it bugged me leaving things blank or tearing out pages (a weird quirk I fully embrace). I didn’t want fluff, and as pretty as they were, many of them were SO flowerytwirlygirly with swishyswirly graphics that I craved something simple and minimal. So, I popped open some design programs on my computer and went to work. 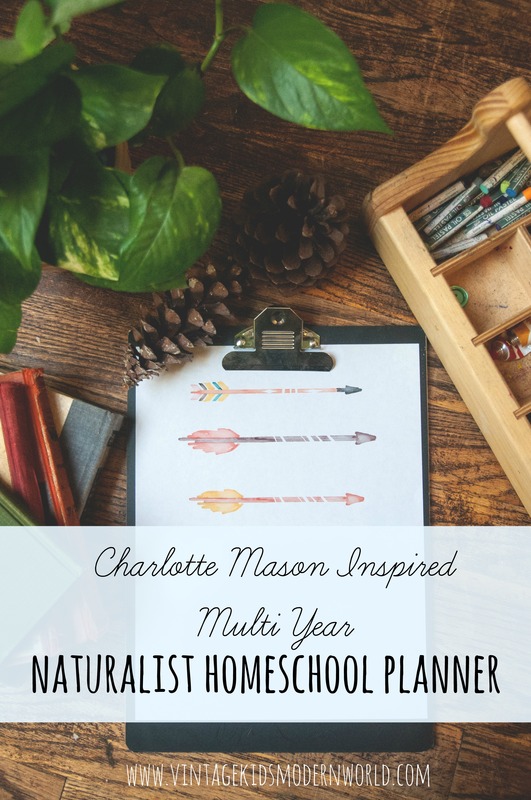 We use the Charlotte Mason approach to homeschooling, and we concentrate heavily on the simple study of nature, especially in these early years. The watercolor images that I’ve included remind me each month to appreciate the beautiful and gentle approach to learning through the seasons that I strive to offer my children. I am putting the finishing touches on my entire 2015-2016 Charotte Mason Naturalist Planner (and it will be available soon in my etsy store, so stay tuned!) but to say hello on this balmy first day of September, I want to offer my monthly calendar and planning sheet completely free! Each monthly sheet is not just for recording dates and appointments, but for actually planning out your month. Charlotte Mason-based curriculum is often based on a three-term schedule. However, everyone’s terms start at different times based on you personal school schedule. There will be a term planning sheet in the completed planner on etsy, but the notes at the bottom of each sheet will give you a quick reference and a way to schedule all of your “extras” – your selected artist, composer, and poet, as well as the handicrafts and habits you’re working on – whether it’s just for the month, or as part of the term that you’re in. I’ll be sharing more about how I use my full planner, what curriculum we’re using this year (for 5th, 2nd and Kindergarten) and how I schedule our day coming up over the next few weeks – so make sure to subscribe to the blog so that you don’t miss all the juicy, sticky-fingered, coffee-filled homeschooling details! And a quick tip – when you print out your calendar, I definitely recommend springing for a high quality paper, like this. It’s the happy medium between regular old printer paper and the 110 lb. card stock that I use. I wasn’t sure it was worth the extra cost, but I always felt like home-printed sheets never measured up to store-bought and they always felt “cheap”. The paper quality was why, and paying a few extra dollars for a nicer paper makes all the difference in my book! It’s not as see-through, there’s very little pen bleed, and it just feels nicer. And now I sound like a paper-nerd. So enjoy – print away to your heart’s content, a month at a time or all together, and share it with your other homeschooling mamas, but be a dear and don’t sell it, ‘k? And make sure that you have color ink or have it printed at a Kinkos near you- it makes the pictures oh so pretty. Paper nerd. I know. This entry was posted in Homeschooling, Printables | Bookmark the permalink. These are so pretty! Thanks so much for sharing this with us at Savoring Saturdays linky party! We’d love for you to come back and join us again. Have a great rest of the week.